"The excitement and energy supporting the Mickey Thompson cutting-edge branding efforts made it fun and easy to design exhibit concepts for them. 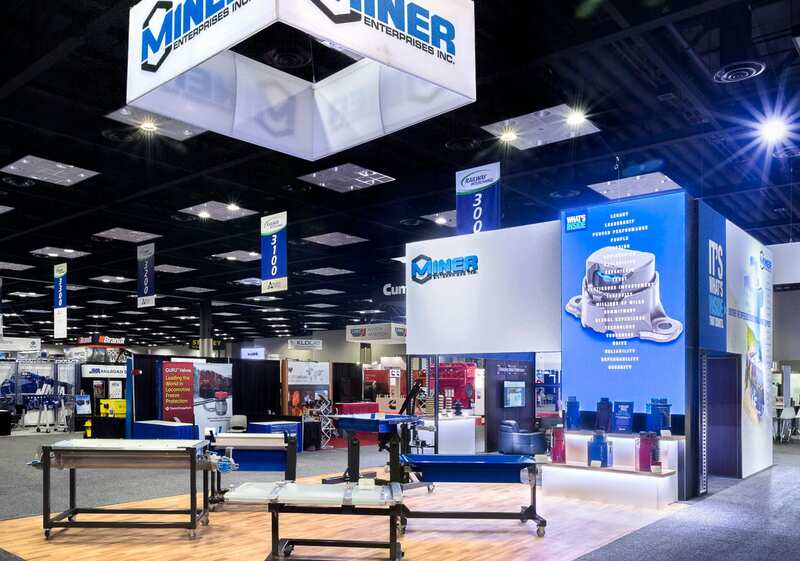 When a customer is producing creative graphics, exhibit design inspiration flows with ease." Mickey Thompson Performance Tires and Wheels exhibited at the 2016 SEMA Show in Las Vegas, NV, from November 1st – 4th, 2016. They were re-branding, and this new booth at SEMA supported that effort. 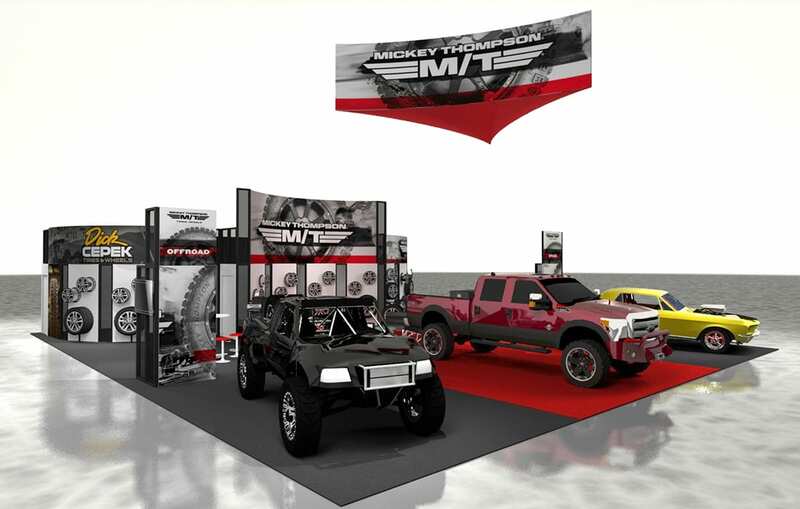 With guidance from Mickey Thompson Performance Tires and Wheels, Evo Exhibits prepared a proposal for the 50’ x 60’ exhibit space focusing on results (i.e. on budget, on time and on brand). Good visibility and line of sight. Dynamic and unique display of products. Showcase prominently new graphic brand direction. Hanging signage to draw attention to the logo & message. Each space should contain enough room for 5-6 people. Large storage area for multiple purposes. Lockable for purses and briefcases. Possible mail room type function. 1 to 2 areas with computers to show website and/or for booth personnel to utilize as workstations. MT Truck; (7) tires and (9) wheels. C-Peck; (3) tires and (5) wheels. Street & Strip; (12) tires, (5) wheels. RESULT – PICTURES SAY IT BETTER! The proposal was issued in May 2016 and the exhibit shipped in October 2016 to arrive on time, on budget, and on brand for the SEMA show November 1st! Fun fact! Stow, Ohio – Aug. 18, 2016 – Danny Thompson, son of the legendary Mickey Thompson, set a new land speed record for a piston-powered vehicle in the Challenger 2 streamliner during Speed Week at the Bonneville Salt Flats on Mickey Thompson Bonneville LSR tires.